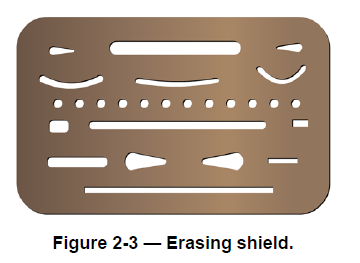 You must be very careful in selecting an eraser (Figure 2-2, frames 1 through 5); choose one that will remove pencil or ink lines without damaging the surface of the drawing sheet. A vinyl eraser is ideal for erasing lines drawn on tracing cloth and films. An ordinary double-beveled pencil eraser generally comes in red or pink color (sometimes called a pink pearl). A harder eraser (sometimes called a ruby red) is designed for erasing lines in ink. The art gum eraser, made of soft pliable gum, will not mar or scratch surfaces. It is ideally suited for removing pencil or finger marks and smudges. You can also use a kneaded eraser—the type used by artists. It is a rubber dough, kneadable in your hand, and has the advantage of leaving very little debris on the drawing sheet. On an electric eraser, the control switch is directly under the fingertip; the body of the machine fits comfortably in the palm of the hand, and the rotating eraser can be directed as accurately as a pencil point. Refills for either ink or pencil erasing are available.